It’s always a great pleasure to introduce an update of our software to you. Today it’s time for Version 7.4.4! The update mainly concerns centralized backup features of the product. Our Server Network edition is designed specifically to facilitate corporate centralized backup procedures in small and middle-sized organizations. The solutions allow an administrator to perform all network backup tasks from a single control point. A user is able to create an individual task for each remote computer or an overall task for all workstations in a network. Workstation and Server Agents run in a service mode and allows performing tasks in working hours: employees may even be unaware their data are backed up. 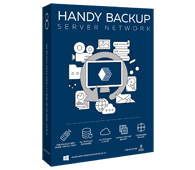 The Server Network edition allows you to manage all enterprise backup and recovery workflows from a single control point. Try free for 30-days! Enhanced version supports new opportunities of functioning in networks with multiple subnets. Now you can back up, restore, and synchronize data of remote computers from a management panel even if they are on different subnets. Automatic remote backup procedures have become more convenient! The update also brings stability improvements to deactivation of individual components. Now you can disable services of management panel or remote Agents without any impact on productivity of other parts of your network backup system. Furthermore, we have enhanced notification system: messages about failed connection with a component have become more informative, now you can get detailed report about the cause of the error. Download version 7.4.4 to enjoy the enhancements (built on Oct 16, 2013)!